I have quite a few crafty lady-friends and we’ve always talked about getting together and just making stuff- one of us would show the others how to make jewelry, another would teach us all how to sew, another would show us how to bake awesome deserts, and so on and so on. And so we formed the Ladies’ Domestic Arts Society, a monthly meetup with the sole purpose of making crafty things together. 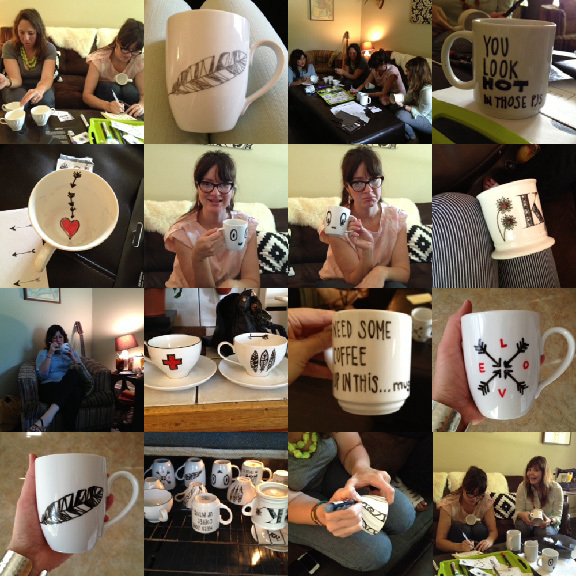 Recently, we gathered at my home and decorated coffee mugs with porcelain pens while catching up on each others’ lives and sipping mimosas. It was a really fabulous time and I’m already looking forward to our next meetup. FANTASTIC!!! Where do you get porcelain pens? Thanks, Kim! I ordered the porcelain pens from Amazon. Pebeo is the brand name.